Each year, summer trade means great challenges for car garages and tyre dealers. As a result and at just the right time, Yourtyres.co.uk, the online trade customer shop by Europe’s leading online tyre dealer Delticom, is introducing a new feature intended to make the daily work of the shop’s customers easier: An advice mode is available from now on at Yourtyres.co.uk. When changing from the purchasing to the sales view, the individual end customer prices are displayed instead of the actual purchase prices. In order to use this feature, users of Yourtyres.co.uk simply have to insert their individual markups for the different item groups. 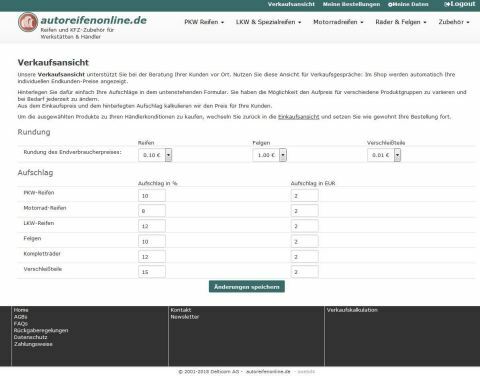 From the markup and the purchase price, the online shop automatically calculates the personal end customer price. The usual purchasing view is also still available. “As a partner of our business customers, we want to make the use of our online shop as easy and as convenient as possible for them. In addition to our low prices and fast delivery times, our new shop feature will also offer them support in the future for customer and sales talks,” explains Andreas Faulstich, Head of B2B at Yourtyres.co.uk. Of course, as well as the new shop function, the tried and trusted features will also still be there at Yourtyres.co.uk: There are no minimum order quantities or delivery fees, but many payment and return options. To enable the greatest possible flexibility for trade customers, the online shop also has a comprehensive range of tyres of various different makes and models – from high-performance premium products to low-cost quality tyres. The new products in our range include, among others, the Falken Ziex 310 and Michelin Primacy 4 summer car tyres, and the new Michelin Road 5 and Bridgestone T31 motorcycle tyres. There is also something new to the range for price-conscious customers: Yourtyres.co.uk offers current CST summer tyres in more than 60 dimensions, including the Marquis MR61, Medallion MD-A1 and Adreno Sport AD-R8, meaning that we have the right product for all individual requirements. As well as the new, practical shop function and the various purchasing advantages, Yourtyres.co.uk also offers trade customers lots of potential to gain new clients. For example, collaboration as a fitting partner enables your own business to be supplemented with customers who order their tyres from one of the Delticom B2C shops (Mytyres.co.uk, Tirendo.co.uk, Moto-tyres.co.uk). This creates an effective connection between online and offline trading.